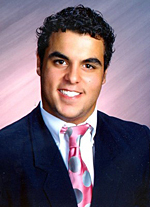 In Memoriam: Anthony L. Esposito Jr.
2:34 p.m., Dec. 3, 2009----Anthony Louis "Tony" Esposito Jr., 20, a junior biology major at the University of Delaware from West Orange, N.J., died Nov. 26. Mr. Esposito was born in Kastoria, Greece, the son of Anthony L. Sr. and Adrianna (DeLuca), and was a lifelong resident of West Orange. He graduated from Seton Hall Preparatory School in West Orange, where he was a member of its varsity football team, concert band, Italian club, president of the ski club and its fishing club. Two of the many joys in his life were fishing with family and friends, and watching the New York Yankees. In addition to his parents, he is survived by his paternal grandfather, Anthony Esposito; his maternal grandparents, William and Viola DeLuca, and numerous aunts, uncles, cousins and friends. A funeral mass celebrating his life was held Dec. 2 at Our Lady of the Lake Church in Verona, N.J.
Memorial contributions in his memory may be made to the Anthony L. Esposito Jr. Scholarship Fund, c/o Seton Hall Preparatory School, 120 Northfield Ave., West Orange, NJ 07052. Tributes and remembrances of Mr. Esposito may be shared with the family at [www.mem.com].